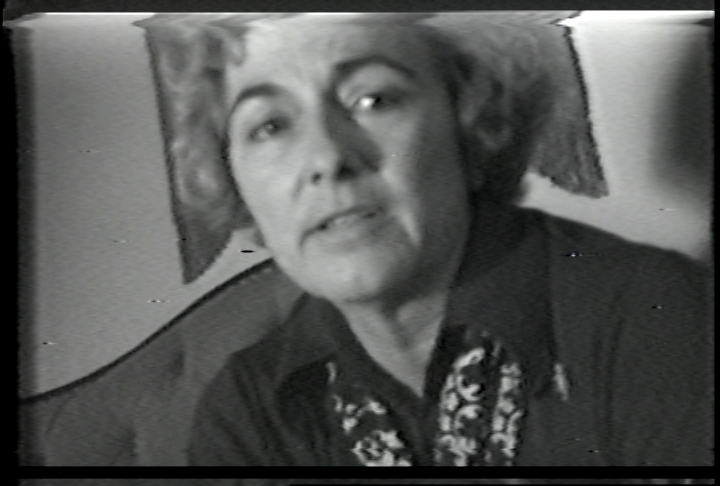 In October 1969, the Videofreex visited the home of wealthy political and social activist, Lucy Montgomery, as she was hosting the Black Panther Party of Chicago during one of their most fraught times — the period just after Chairman Bobby Seale was wrongfully imprisoned for inciting riots at the Democratic National Convention a year earlier. This particular video documents a discussion with Lucy Montgomery herself interviewed by David Cort, one of the Videofreex. Their conversation primarily concerns the intersection — or lack thereof — of political theory and practice, the power of collaboration amongst radical groups, and the redistribution of wealth in America, as well as other topics pertinent to counterculture values. Montgomery offers an interesting take on these issues, as she is clearly very affluent — a fact made obvious by the home in which the interview takes place, and a fact not unnoticed by her interviewer. She insists that her position in society, and the position of others like her, can be instrumentalized for good, if only they were to recognize the potential benefits their status and resources could afford to revolutionary action as it was being practiced by groups like the Panthers, and in some respect, the Videofreex themselves.